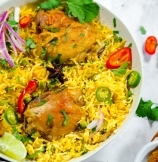 Coconut yellow curry Chicken and Rice, an one pot meal all prepared in Instant Pot. Dairy free. 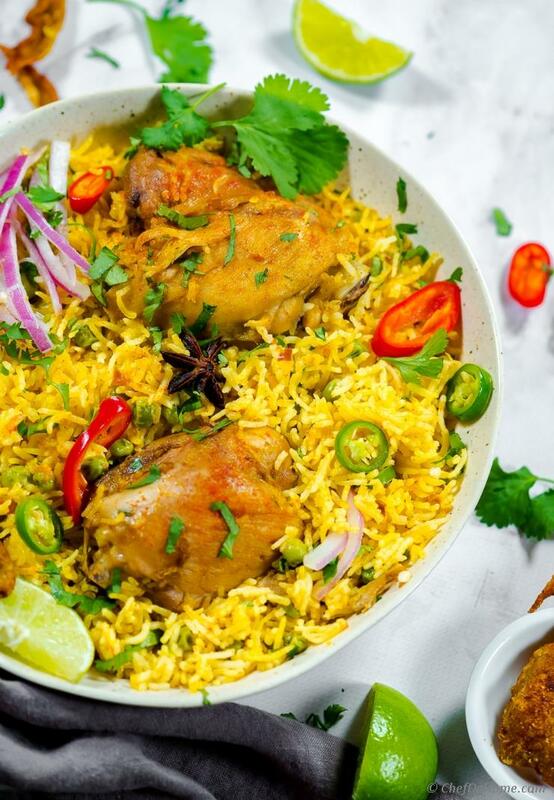 Curry Chicken Rice is my ultimate one-pot weekday chicken dinner. Flavored with homemade yellow curry paste, coconut, and spices. 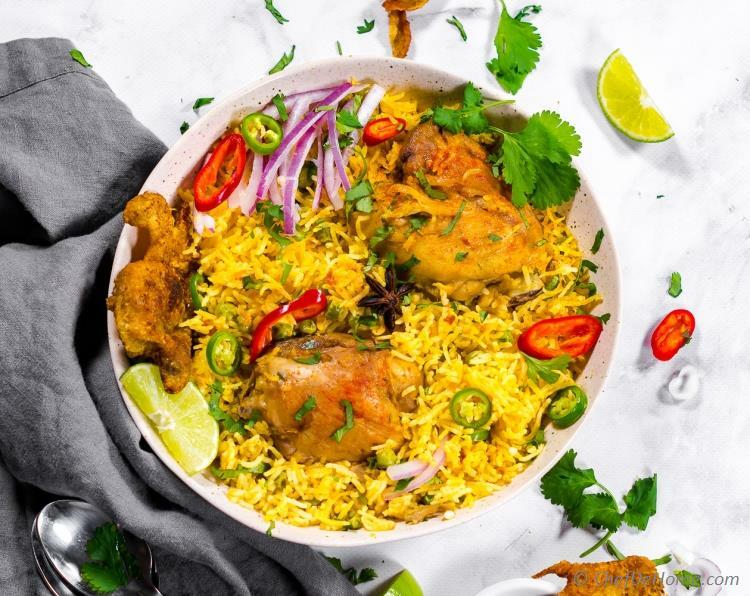 This Instant Pot Chicken Rice are fragrant, mild spicy with subtle flavor and richness of coconut milk. 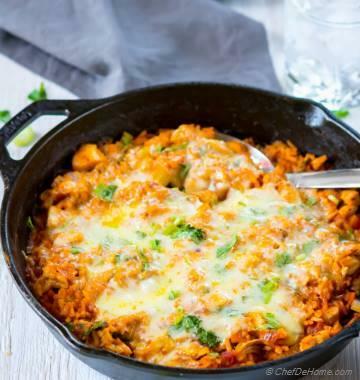 Dairy free, nut free, perfect for meal-prep or a quick weekday dinner at moment's notice. Recipe comes with instructions to cook Chicken Rice in Instant Pot. I have also included electric pressure cooker method in notes. This recipe showcases the yellow curry paste which I shared with you last week. Yellow curry paste is one versatile paste which you will always find in my refrigerator. 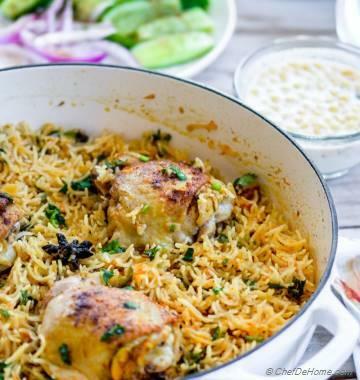 From Chicken Khao Soi (yellow coconut curry soup) to these coconut curry chicken rice. It not just works well, it makes everything taste delicious. Did I tell you, it has good refrigeration life too! Make once and use many times for weeks. 3) close instant Pot. Done! 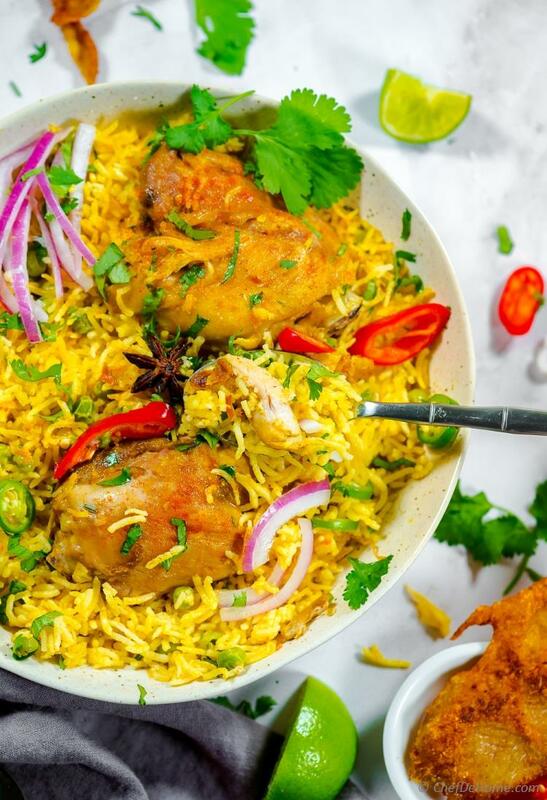 This curry chicken and rice recipe is my fusion Modern take on classic Curry Chicken and Rice with 1) blend of Asian and Indian spices, and 2) yellow curry paste, and 3) Instant Pot (pressure cooker) method. For above reasons, it is not really a Indian Curry Chicken Rice but have touch of South Indian cuisine and influence of Thai. It is more of how I like Chicken and Rice than representing a cuisine. If you looking for more classic and regular dutch oven method version of this recipe. I recommend checking my One Pot Curry Chicken and Rice recipe. The earlier version uses base of onion-garlic-ginger paste and Indian spices such as Garam Masala. This version uses coconut milk and yellow curry paste which is blend of chilies, ginger, garlic, lemon zest, lemongrass. One thing that stands common is Curry Powder. There is not curry chicken without it. (I'll be sharing recipe to make own curry powder soon). 1) Coconut milk gives rich creamy texture to rice. 2) It mellows the flavor of chilies and spices. 3) Along with Whole spices (star anise, bay leaf, mace) it makes rice fragrant. 4) Keeps meal Dairy free. I highly recommend adding coconut milk and spending some time to make fresh yellow curry paste. It really makes a lot of difference in flavor and texture of these Chicken Rice. Garnish with cilantro leaves, serve sliced red onion, and lime wedges on side for a splash of freshness. I hope you will enjoy as much as we did. Please pray to God with me that she rest in peace. Amen..
Smart Swap Add some shrimp, or use all seafood for Seafood Rice. 1. 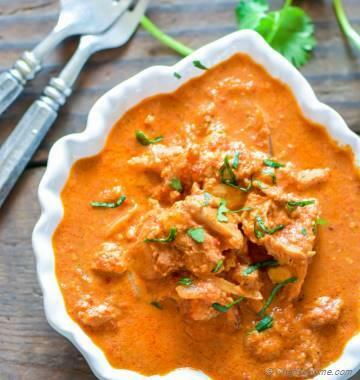 In a bowl, add chicken thighs, season with 1/2 tsp curry powder, lemon juice and generous 2 pinch of salt. Set aside. Start Instant Pot to saute setting. Heat oil. Ad chicken and cook until no longer pink from both sides (2-3 minute each side). Remove in a plate. 2. In Instant Pot, add curry paste, followed by remaining curry powder, whole spices, chili powder (if using) and saute 30 seconds. Add tomatoes and simmer until oil separates (2-3 minutes). 3. Add rice, coconut milk, salt, green peas with water (or stock if using). Mix well. Return chicken to pot. Close the lid. Set to cook on Manual, High Pressure for 4 minutes. Once timer completes. Let pressure auto release for 10 minutes. Adjust the amount of salt, if using chicken stock or if curry powder with salt. ***Whole Spices: I use 2 star-anise, 1 mace blade, and 2 bay leaf. You can also use mace powder. I suggest deglazing after you sauté the chicken , will prevent burning !!!! I’ve done this recipe twice now, and while it is very tasty, it gives me the ‘burn’ message on my instant pot. Any helpful suggestions to avoid this? I made the recipe with millet; used 1 C water, 1 C coconut milk; seasoned salt on chicken w/ curry; left out tomatoes and only used 1tsp curry, 3/4 tsp salt, and 1tsp garam masala mixed in coconut milk and poured over chicken--absolutely delicious!! !